Lemons are one of my very favorite flavors to use in all kinds of dishes. 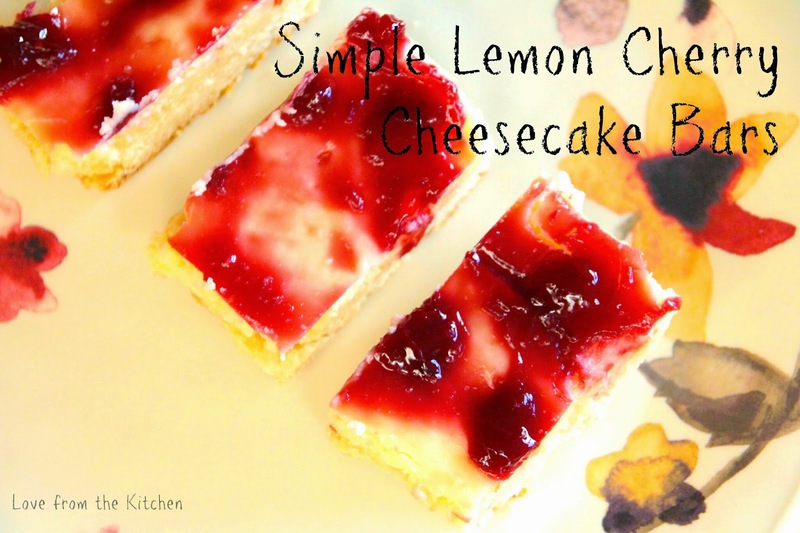 Lemons make great dessert dishes (like today's Simple Lemon Cerry Cheesecake Bars) but also are fantastic in savory dishes - like Creamy Lemon and Basil Pasta or Roasted Potatoes with Lemon Vinaigrette. 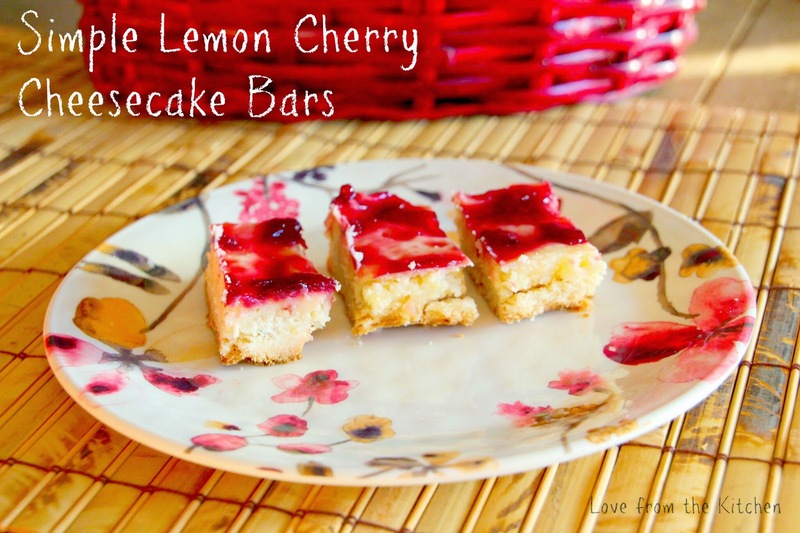 I like lemon so much that I am going to fill up this week with lemon recipes! Feel free to add a link to your favorite lemon recipes in the comments. I'd love to hear about them! 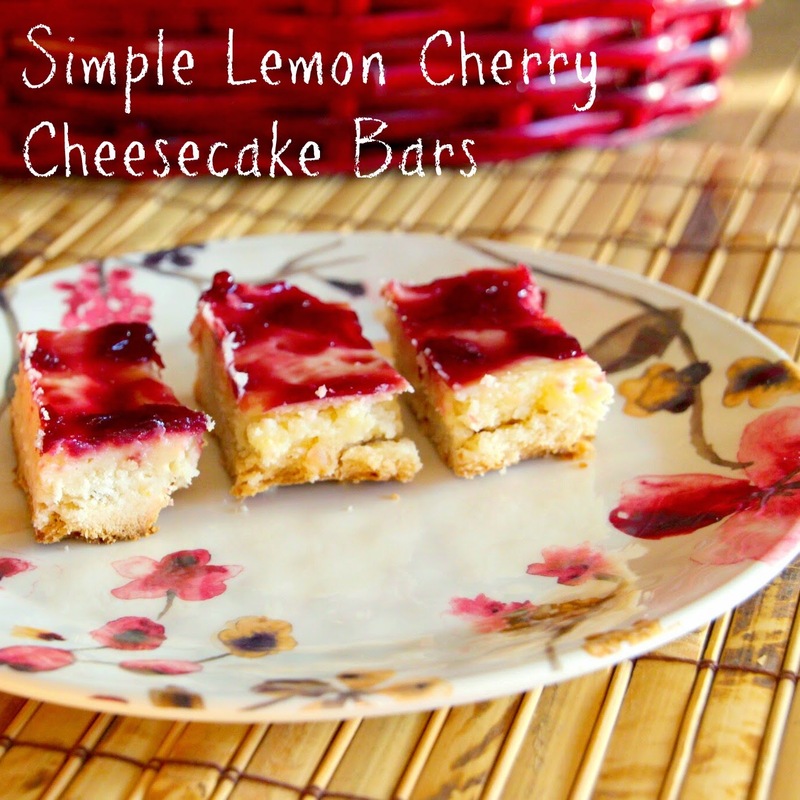 These bars are truly simple to make with only 8 ingredients, but those ingredients come together into a beautiful and irresistable dessert. The crust is a sweet and tender shortbread and the filling is brightly lemony. 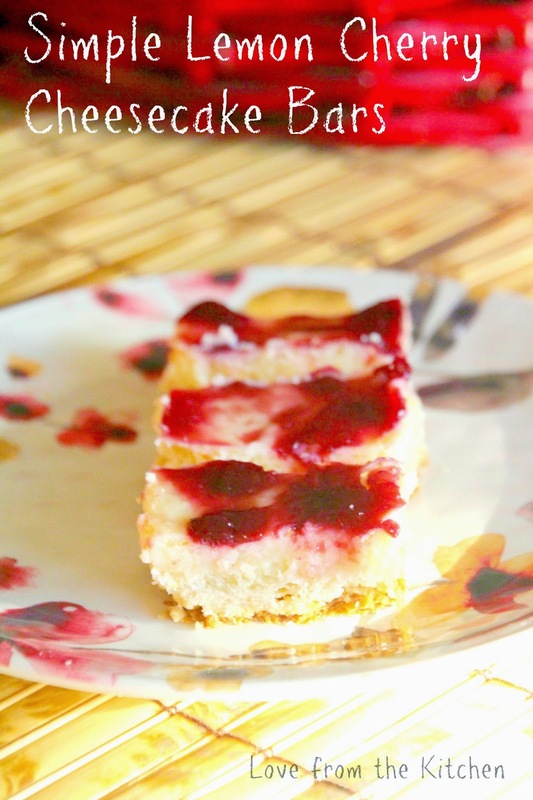 The cherry preserves on top add both a beautiful color contrast and a touch of sweet cherry flavor. With only about 10 minutes of "work" time, these are the essense of simplicity. Be sure not to tell anyone either - they are so lovely and delicious, no one will ever know! Heat oven to 350°F. Spray 9-inch square pan with nonstick cooking spray. In large bowl, combine 1/2 cup sugar and butter; blend well. Add flour and mix until crumbly. Press mixture in bottom of sprayed pan. Bake at 350°F. for 15 to 18 minutes or until edges are light golden brown. Meanwhile, combine all filling ingredients and beat well. Remove pan from oven. Pour the filling over the partially baked crust. Return pan to oven; bake an additional 15 to 20 minutes or until filling is set. Cool 30 minutes. Stir remaining preserves and spread evenly over bars. Refrigerate 30 minutes. Cut into bars.